I was back at Stockerley Burn last week (see “A case of mistaken identity?”) and was surprised to find that the Oedogonium that was so prolific back in June has now almost completely disappeared and the stream bed is now dominated by Cladophora glomerata. How do I know? Look at the illustration below: even with the relatively weak magnification offered by a hand lens you can see the characteristic branched structure that distinguishes it from an unbranched species such as Oegogonium. There is almost nothing else that could be confused with Cladophora in our freshwaters, so long as you perform this simple test. I saw Cladophora glomerata at almost all of the sites I visited during this trip, which was not a great surprise as it is a very common species in enriched lowland rivers and streams. 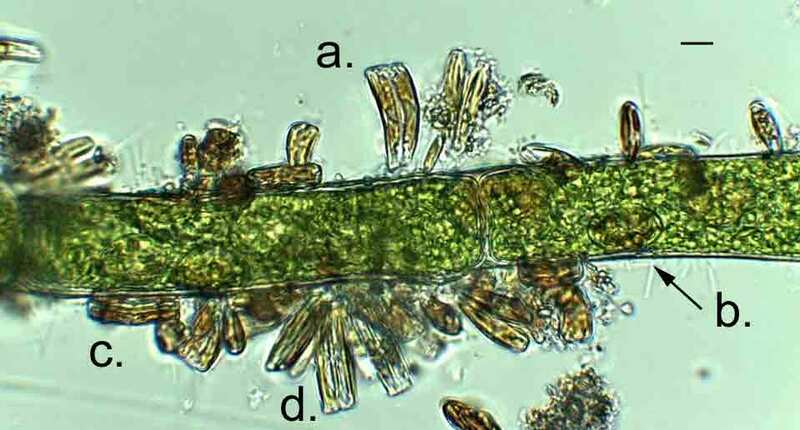 However, the Cladophora filaments did not have their characteristic green colour at many of these sites, mostly tending to a brownish hue due to the large numbers of diatoms which were growing on and around these filaments. 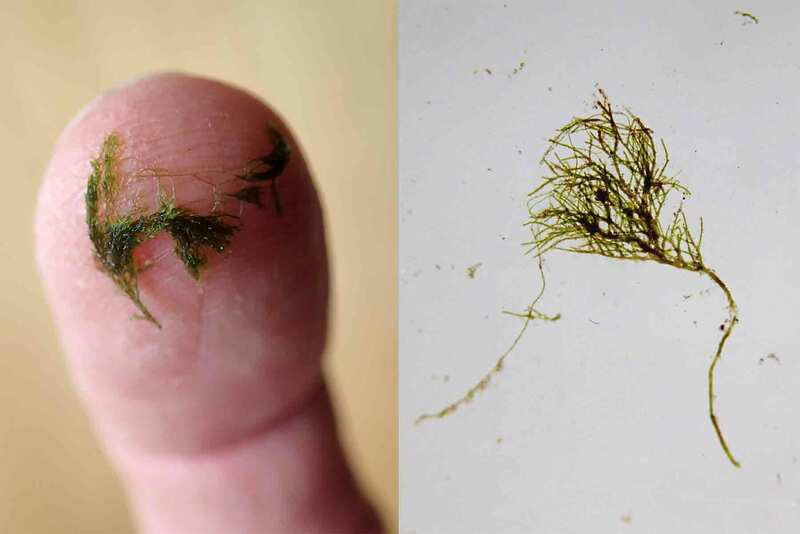 Left: Filaments of Cladophora glomerata on my fingertip, showing the characteristic branched structure; right: a wet mount of Cladophora photographed with a macro lens. The entire structure is about four millimetres long. Two of these diatom-smothered filaments are illustrated below. You can see the upright, curved cells of Rhoicosphenia abbreviata, each attached to the filament by a small mucilage pad, along with some lower-profile cells, with an oval outline. These belong to the genus Cocconeis and I think I could see at least two species (C. pediculus and C. euglypta) though it is hard to be sure when examining them in the live state. The cells on the lower of the two images do look more like C. pediculus to me. There are also a few cells of Fragilaria, again standing erect on the filament. The second image shows another filament from the same location but this one is covered almost entirely with Cocconeis cells (mostly C. pediculus, I think). The lower, more streamlined, profile of these makes them more suited to situations where they are more exposed to the current. Indeed, I suspect that there are subtle differences in the composition of this epiphyte flora throughout the tufts of filaments though it is hard to do more speculate when these differences are at a scale that is difficult to either see or handle whilst standing in a stream. What effect do all these epiphytes have on the growing Cladophora? The diatoms are trapping sunlight that would otherwise have been used by the Cladophora so the net effect of all of these is akin to moving a houseplant from a well-lit window ledge to a dark corner. On the other hand, Cladophora grows very quickly so an probably stay one step ahead of the epiphytes most of the time. There is evidence that prolific epiphyte growth leads to the eventual death of some aquatic plant. This has been suggested in the Norfolk Broads where gradual increases in nutrients favoured epiphytes which, in turn, smothered their host plants (slower growing than Cladophora), leading to the long-term deterioration of the unique habitats of the Broads. Epiphytes on a Cladophora filament from Stockerley Burn, August 2014; a. Rhoicosphenia abbreviata; b. Cocconeis sp (from above: valve view); c. Cocconeis sp (from the side: girdle view); d. Fragilaria sp. Scale bar: 10 micrometres (1/100th of a millimetre). 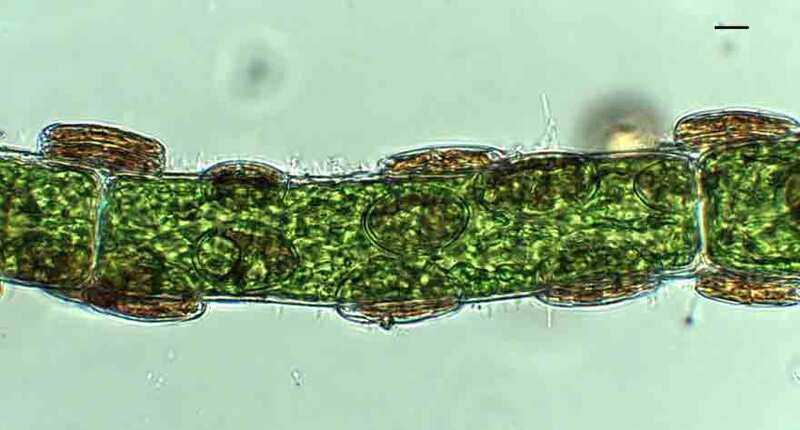 Cocconeis cells epiphytic on a filament of Cladophora glomerata. Scale bar: 10 micrometres (1/100th of a millimetre). This entry was posted in Uncategorized and tagged algae, blanket weed, Cladophora, diatoms. Bookmark the permalink.